Here is a fascinating instrument with untold (at least until now) historical importance and significance. 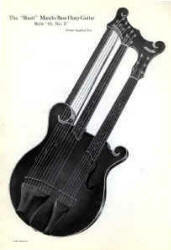 A carved top harp guitar with f-holes that can be played like a guitar, a harp guitar, or an acoustic bass guitar - in 1912! Oh, did I mention that it may feature the world's first truss rod? Shutt's vision and cleverness just go on and on, and perhaps nowhere as uniquely as in his M-B-H-G. Shutt also made a more standard, Gibson-type harp guitar. Click on the applicable link below for the full story.